Christina White Salon is the expert in cold fusion extensions. 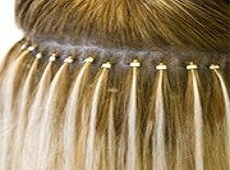 Cold fusion extensions are strands of hair that are slipped into a cylinder and are compressed onto the hair close to the scalp. The benefits of cold fusion hair extensions is that you are able to use them again for up to 12 months. The drawbacks is that they tend to need more maintenance. The cylinders need to be tightened or the hair will slip and/or fall out. This is true especially for people with thin to fine hair. Our stylists are all certified in cold fusion extensions. Please call us for a free, no obligation consultation at 314-380-4508. Why people love this method: No glue or chemicals. The bead does all the work. Beaded extensions are really easy to adjust and tighten. Each strand has 360 degrees movement, so styling is easy, too. If you think you like micro link extensions take a look at Fusion Extensions and Tape In Extensions.